Background: The summer of 2010 was our first summer in this house, our first home. 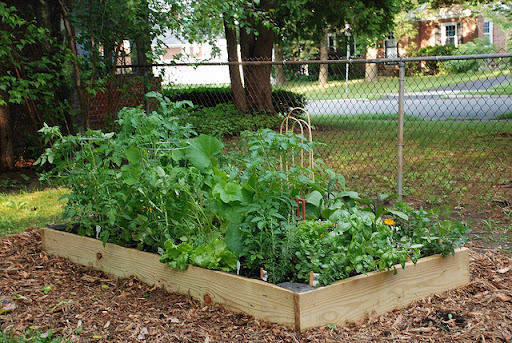 We built and planted our first raised bed vegetable and herb garden, loosely following the square foot garden method. We planted too many things and generally had no idea what we were doing, but we certainly learned a lot! We harvested tomatoes, eggplant, herbs, cucumbers, beans, lettuce, and peppers. We made notes about what to do in future years and hashed out plans for building more beds. In the summer of 2011 our time and attention was consumed by the darling infant who had arrived that spring, and pretty much everything else fell off our radar. We hastily planted some tomatoes and peppers, watched the mint that we stupidly planted the year before take over everything, and really didn’t touch the garden. This year I’m determined to have a successful garden. Being outside and having a few minutes to myself to tend the garden is calming, centering, and good for the soul. I want that back in my life this summer. I am imagining summer evenings of putting my daughter to bed and heading to the yard before the sun sets for some time with the garden. That’s not to mention my excitement over afternoons spent showing my daughter the garden and teaching her how to pick and bite cherry tomatoes. She’s still very young, but this is the summer she’ll begin her journey of gardening and learning about where food comes from. 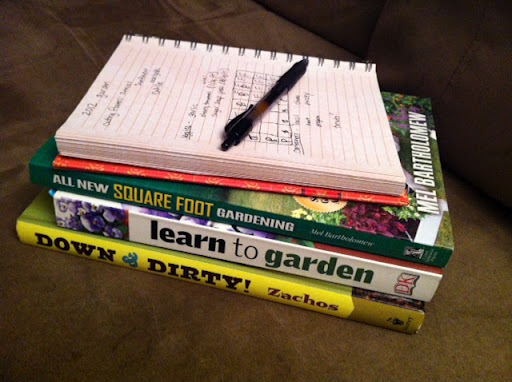 The plan: I’ve spent a couple nights this week thumbing through my gardening books and finalizing my plan for the garden. My challenge is that our family is also doing a farm share. We’re splitting a share with friends, but we’ll still be getting plenty of vegetables from the farm. That changes my planting goals. Rather than planting for a summer of vegetables from the garden, I’m planting vegetables to round out the farm share (hard to predict), that we can easily process or freeze, and that my 13-month old will enjoy picking and eating throughout the summer. Since that will leave plenty of room in the bed, I’m also planning to grow several rows of pretty flowers to cut and enjoy/share through the fall. I originally thought I’d start my own seeds, but clearly that ship has sailed. Perhaps another year, if I can figure out a spot for seedlings that’s free from danger of crushing by child or cat. At this point my plan is to visit a local nursery and co-op to pick up some plants over the weekend, and to get them in the ground within the next few days. The raised bed itself needs a bit of weeding and some soil refreshing, but overall is in pretty good shape. I’ll need to construct/string up some sort of frame and/or netting for the snap peas, but that might be a project for another week. My Mother’s Day request was for some time to work on this project, and I’m raring to go! You can still do seedlings for flowers! It's actually the perfect time now.